Alex Rawlings was a language teacher’s dream. He fell in love with languages when he was eight and learnt Greek, then German, then Dutch. 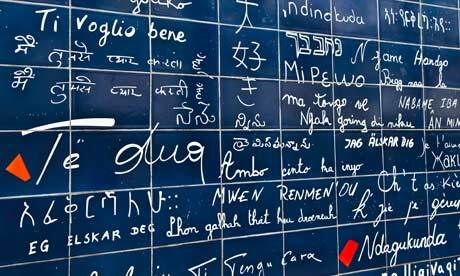 Now, an undergraduate at Oxford, he is the UK’s most multi-lingual student, speaking 11 languages. So what’s his secret? Such enthusiasm is rare: a report by the British Academy this year found there was a growing deficit in foreign language skills. Increasingly, children are choosing not to study languages beyond the compulsory stage – and only 9% of pupils who take French GCSE progress with it to A-level. Language pedagogy has come a long way since the days when repetitive grammar-translation methods were regarded as the only way to learn. Today, task-based approaches are widespread in British schools, emphasising communication and the practical uses of language. For Christelle Bernard, a French and Spanish teacher at St Gemma’s High School in Belfast, these methods of teaching allow her to cast aside the textbook whenever she can. “You need a little bit of grammar, but my approach is much more topic based with as little grammar as possible,” she explains. But there could be a danger in focusing too heavily on task-based methods of language teaching, according to Richard Hudson, emeritus professor of linguistics at University College London. He explains: “There was a strong reaction against grammar-translation. Instead, there was the idea that you could make languages available to less academic children by focusing on communication. “But what happened is that they got rid of the grammar and the translation. It was a classic case of throwing out the baby with the bath water. It’s not fair on children to leave them to work out the rules of language themselves. So could a conjunction of different ideas within language pedagogy be the secret to learning and teaching? Michael Erard studied hyperpolyglots (multi-lingual speakers) in his book Babel No More and says they used a variety of methods. He explains: “They use a mix, with a focus on accomplishing tasks, whether it’s communicative tasks or translation tasks. Luca Lampariello, a hyperpolyglot and language consultant who speaks twelve languages, says: “The best method is the method you like. But although Brits have long been famed for being lazy when it comes to learning foreign languages, the problem may partly lie in the number of hours of language education children are given. “We only give about half the amount of time to language teaching that they do in continental countries,” says Prof Hudson. A report by the European Commission in 2011 listed the UK joint-bottom in major rankings showing the number of languages learnt in each country. National curriculum reforms set to be introduced next year – which will see foreign languages taught from the age of seven – may help, but figures show the UK has a long way to catch up with other European countries. On average, pupils across Europe start learning languages between the ages of six and nine, but for many it starts even younger. In Belgium, learning starts in pre-primary education at the age of just three, and is compulsory until 18. And for children in Spain, Italy and Norway, language classes begin at six. Meanwhile, in Luxembourg, students on some education pathways have to learn up to four languages in secondary education. Chistelle Bernard says that while methods of language teaching in continental Europe are often still grammar-based, it’s the realisation that languages will be useful in later life that helps motivate students. “If we don’t tackle the vocational side of languages, it doesn’t seem to be that relevant to UK children,” she says.